Exercise Does a Body Good. Here is How. Why exercise is good for you. Cell‘s free and accessible review for anyone interested in the changes brought about by exercise. 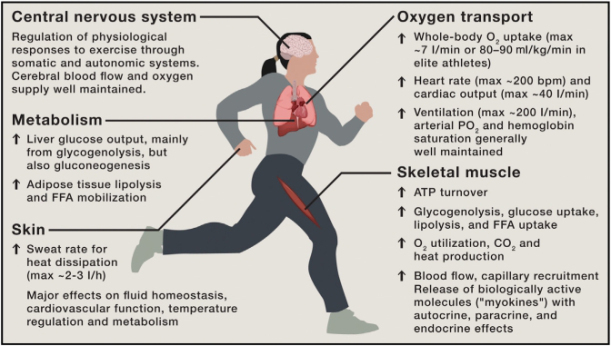 Exercise represents a major challenge to whole-body homeostasis provoking widespread perturbations in numerous cells, tissues, and organs that are caused by or are a response to the increased metabolic activity of contracting skeletal muscles. To meet this challenge, multiple integrated and often redundant responses operate to blunt the homeostatic threats generated by exercise-induced increases in muscle energy and oxygen demand. The application of molecular techniques to exercise biology has provided greater understanding of the multiplicity and complexity of cellular networks involved in exercise responses, and recent discoveries offer perspectives on the mechanisms by which muscle “communicates” with other organs and mediates the beneficial effects of exercise on health and performance.